Hike. Camp. Hike. | Repeat Monthly. Geared up for the wetland exploration adventure. 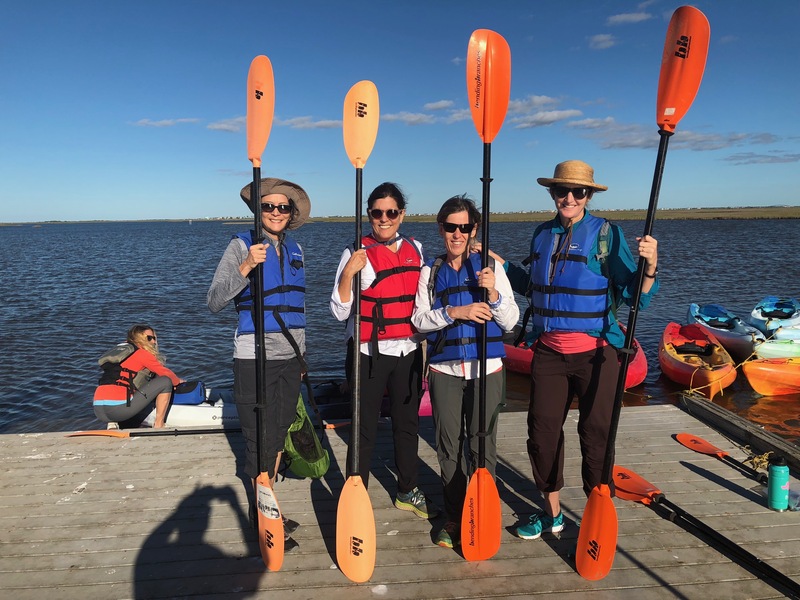 Pros: Interesting new landscape and activities including exploring along the beach and kayaking the wetland trail. 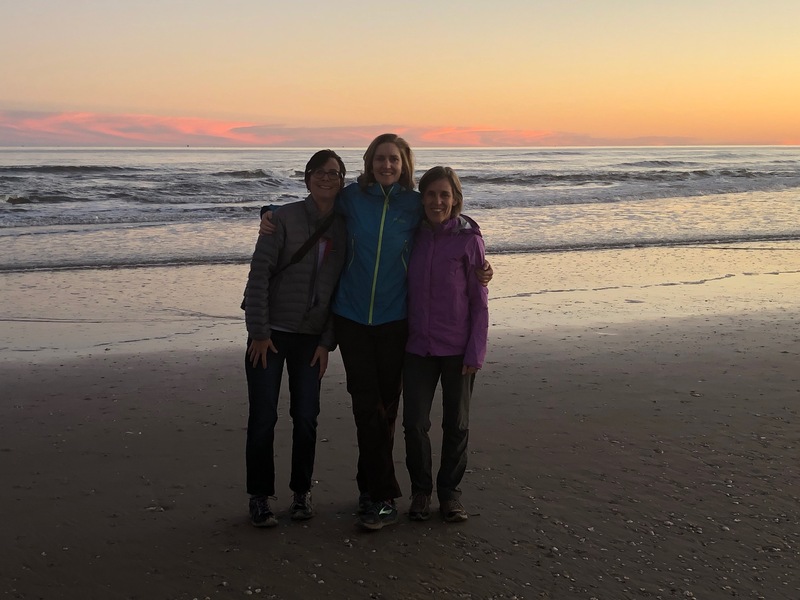 We loved the little town of Matagorda with its colorful history, a charming selection of restaurants bustling with local diners serving a variety of fresh seafood. The birding was amazing, even Suzanne (our birder) was impressed. Cons: The lodging, although spacious, was run down and didn’t seem worth the cost. There were A LOT of mosquitos, come prepared. Sunset after a run on the beach. 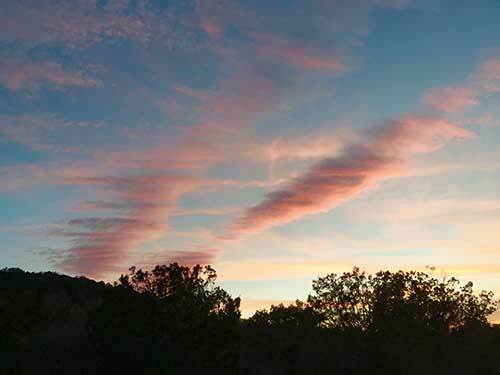 Spectacular sunrise in the Fort Davis Mountains along one of the running trails. At the finish line in the official Spectrum Race trucker hats. 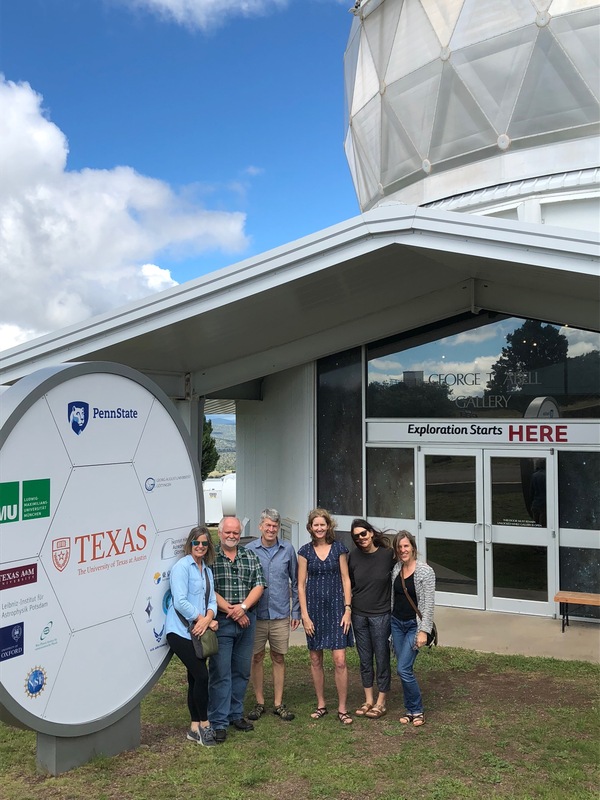 Leave grocery for Tour of Hobby Eberly Telescope at McDonald Observatory, 82 Mount Locke Road | Fort Davis, TX; 30-min drive. Arrive McDonald Observatory. Meet in Visitor’s Center lobby. Check in and get settled in rooms. Jenny is main contact. Drive to Davis Mountains State Park and check out lay of the land. (10 min from lodging), to see it in day time. Leave restaurant and head to race check in at park Check in from 6-8 pm. Leave for Star Party at McDonald Observatory. 20-min drive. Star Party starts at 8:45 pm. Tickets paid – $11.50 each. Return to Fort Davis – maybe at Lupitas 411 State St, Fort Davis, TX or have dinner in Alpine. TBD. They provide coffee in filter packs. If you bring your own loose ground coffee, you will need to bring coffee filters to fit a 4-cup coffee maker. You will have a small sink, small fridge, and small microwave in your room. And yes, you will need to bring plates and silverware. We provide the coffee packs, hot tea, sugar & creamer packs, paper towel roll and two coffee mugs. You may check in on Friday any time after 3:00 p.m. Rain jacket; hydration plan for run; nutrition for run; jacket for evening; cash to contribute to gas, rooms, etc as needed. Amazing tour of the Hobby Eberly Telescope used to explore Dark Energy. 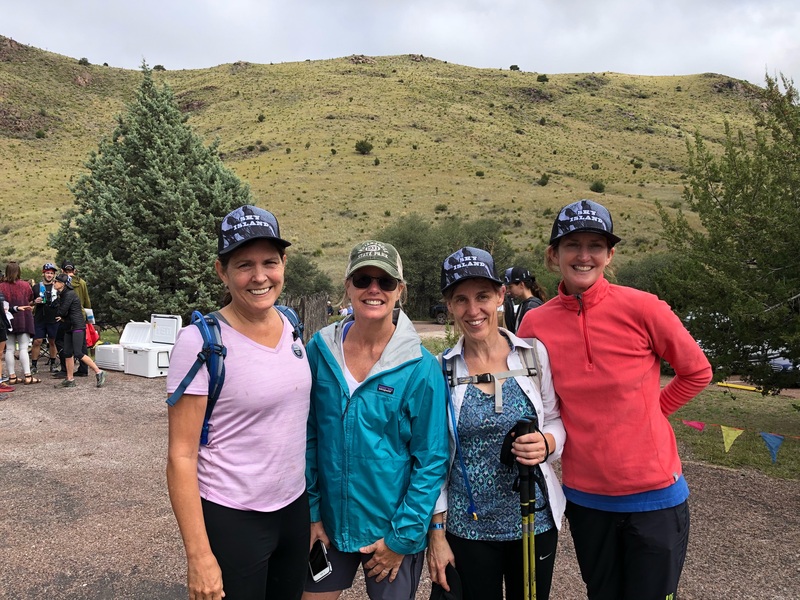 Overview: The Fort Davis trip was our first HCH adventure that focused on a trail run as the main feature. After casually training for a few months, we were excited to try this 25K race/run just to see what it would be like. 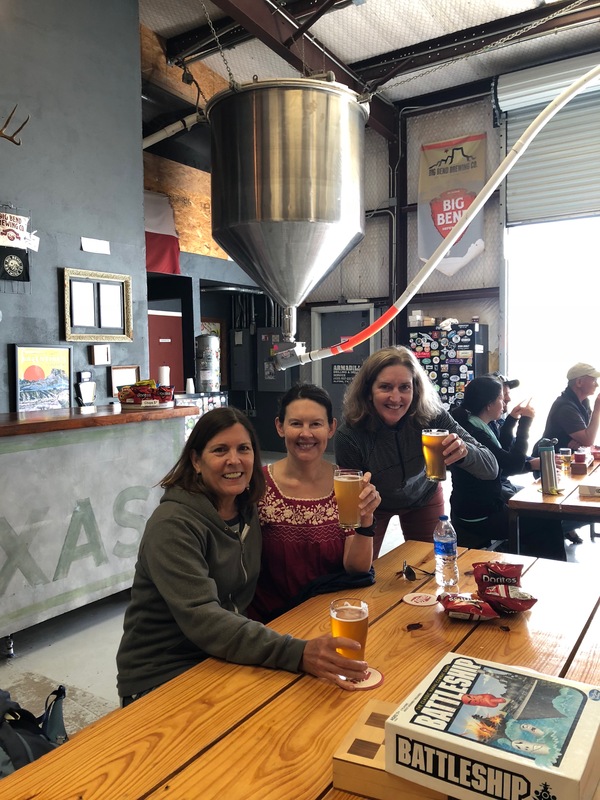 Fort Davis also offers so much more which we took advantage of – visits to McDonald Observatory, Big Bend Brewery, several restaurants in the area and lovely exploration of Fort Davis State Park. The Sky Island race is challenging but doable. The race directors were well organized and the race logistics were great. There was a cap on the number of runners which means the registration fills up quickly as does limited lodging at the park. Ideally we would have stayed at the Indian Lodge inside the park (or you can camp) which is where the race starts and ends. If you decide to do it, make sure to save enough energy for the last 30 percent of the course which is more scrambling than running! 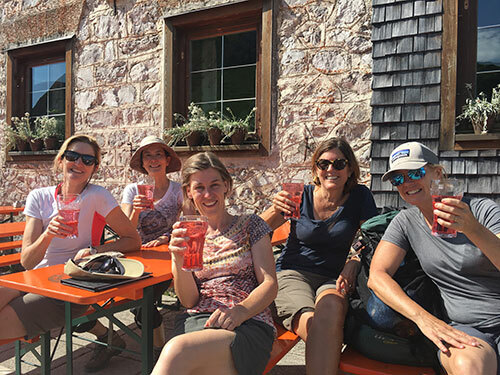 Post-race hydration at Big Bend Brewery in Alpine. 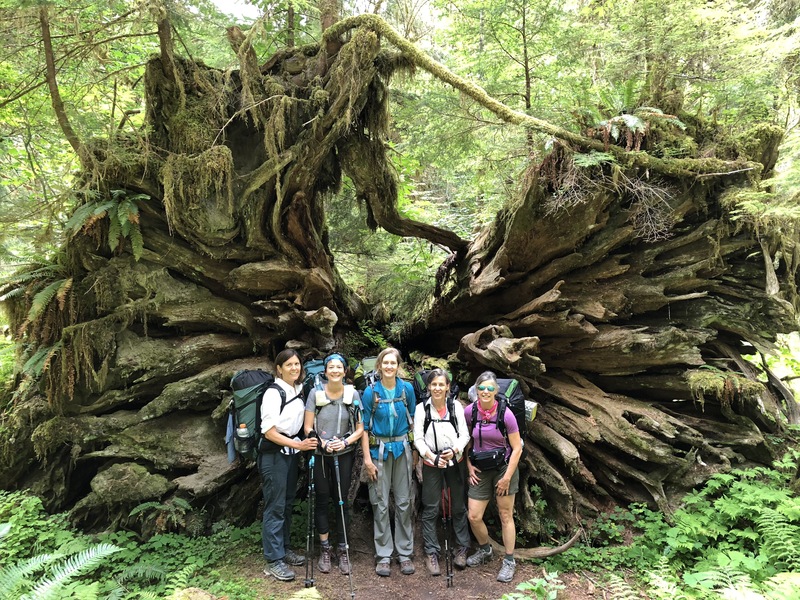 The trees and vegetation in the temperate rain forest of Olympic National Park were something we had never experienced – a truly magical place. Pros: Relatively easy hike for a spectacular rainforest experience. There were many choice campsites available in the busy season. Cons: The porta-potties at the Enchanted Valley campsites were overwhelmingly stinky but as responsible campers we used them because that’s the rules in this crowded camp area. Lots of bugs at the campsites along the river. 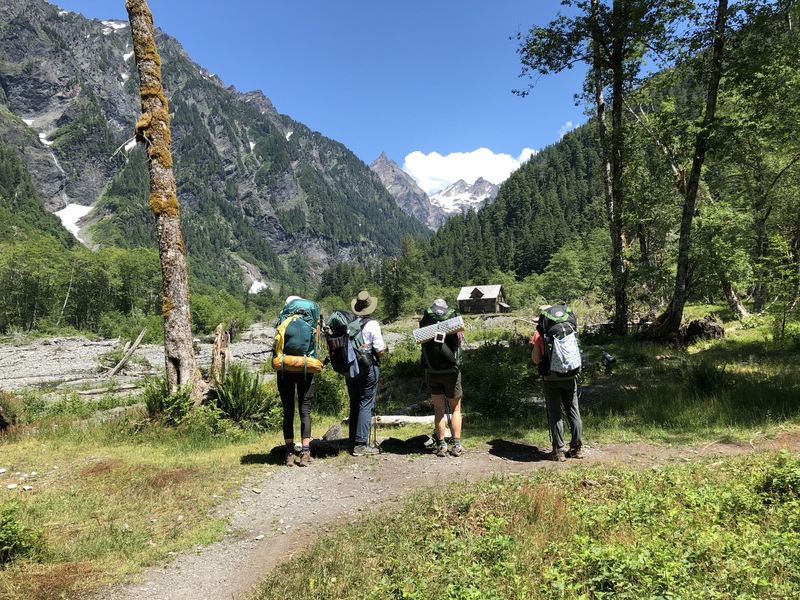 Overview: We began our hike at the Graves Creek Trailhead after an amazing breakfast at the Lake Quinault lodge. We hiked about eight miles to our first night’s campsite at Pyrites Creek. The trek there was pretty easy, not a lot of elevation. On day two we hiked to the Enchanted Valley for a planned two-night stay. We hiked about five miles to get there for an easy day. We set up camp and then relaxed while looking at the beautiful waterfall across the river. 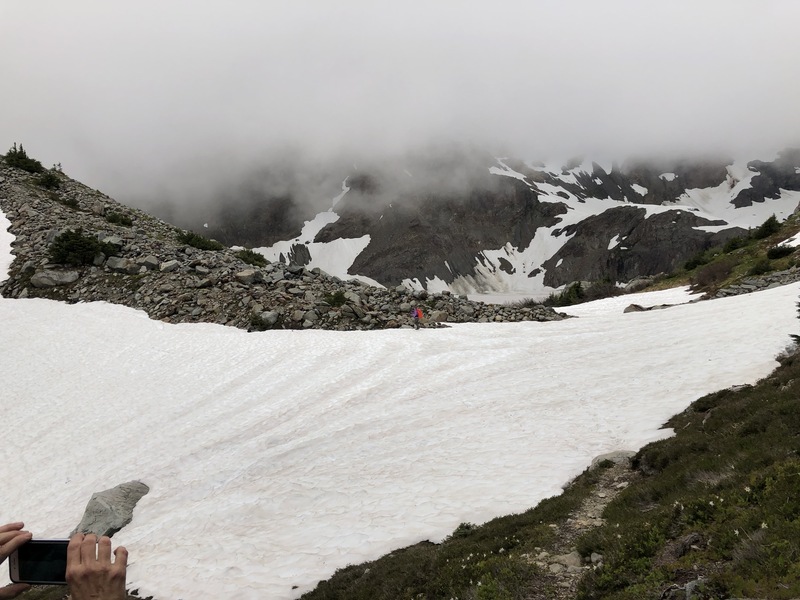 On day three we did a day hike to the Anderson Glacier which was 10 miles roundtrip with several challenging water crossings. To get there we had to go over a few treacherous spots of washed out trail. The glacier was an amazing site. 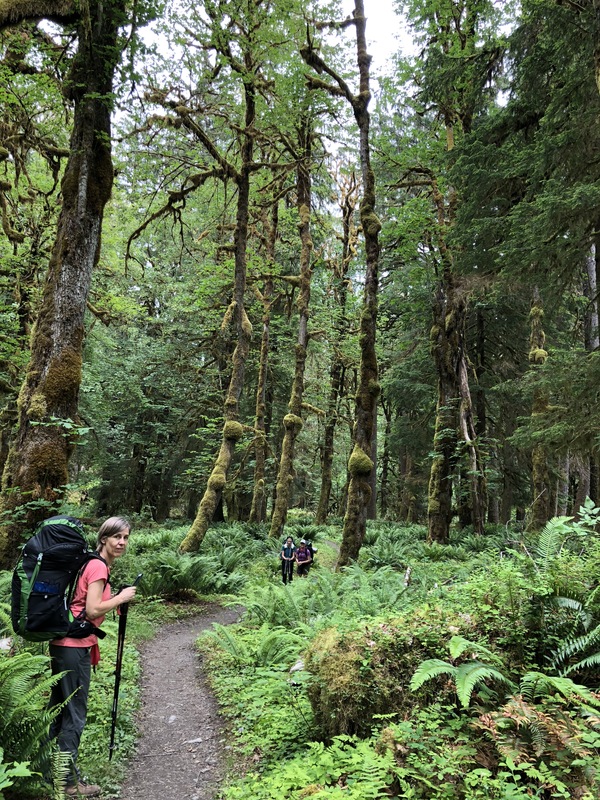 On day four we hiked out of Enchanted Valley to a campsite that was about 4 miles from the trailhead Our campsite along the Quinault River was beautiful but there were a lot of bugs. 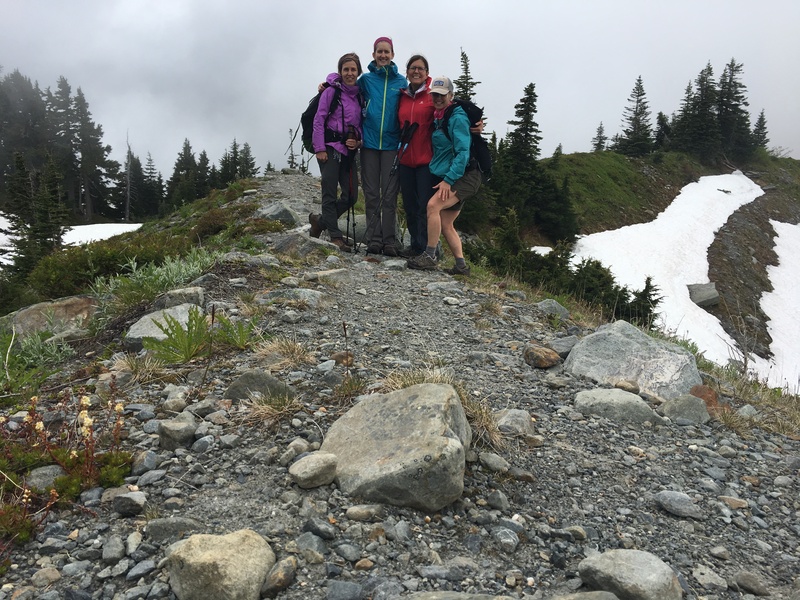 On day five we hiked out to the trailhead and headed to the Queets region to the home of Bettina’s friends. They fed us an amazing lunch and we also explored the beach. Afterwards we headed to Port Townsend where we stayed at historic Palace Hotel. Day two – headed to Enchanted Valley. Waiting for the self timer at Anderson Glacier. A little chilly…. Bettina crosses the snow field below glacier. Travel Time from Austin: 1 hour 15 minutes – beware of speeding in Liberty Hill there was a cop waiting for speeders on our way there and back. We were lucky to have great weather and a view of the full moon over Lake Buchanan. We were extra excited about the campfire since this may have been our last cool evening of Texas camping until fall. 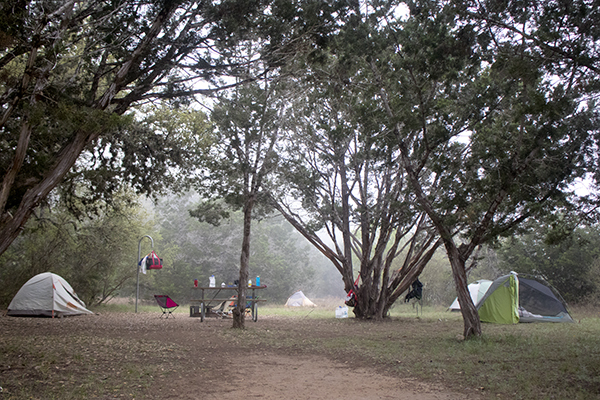 Overview: We have camped at just about every park within 3 hours of Austin since we started our group in January of 2013. Based on these experiences we enthusiastically recommend Canyon of the Eagles. It is a treasure and a rather well kept secret for an overnight tent camping trip from Austin. We aren’t sure why it’s not as crowded as its close neighbor Inks Lake State Park but I suspect it could be because it’s known for its resort facilities and people don’t know it has a great campground. 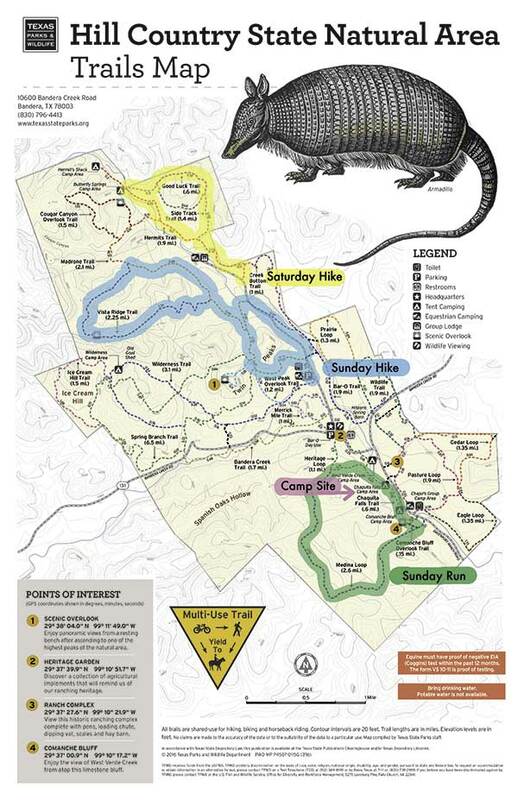 Also, Canyon of the Eagles is an LCRA park so campers with State Park passes may prefer to stay at a state park. 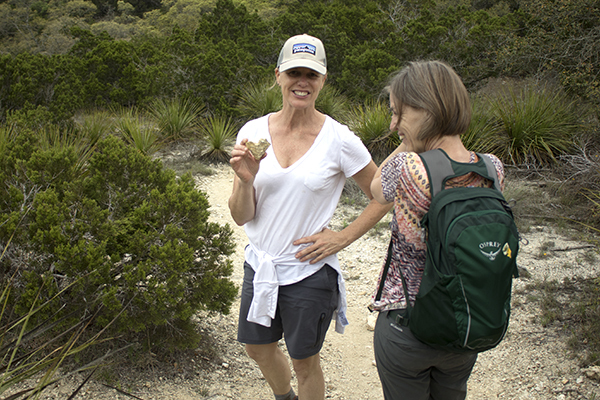 Bettina and Kelly along the Bird and Butterfly Trail watching the bees buzzing inside the yellow cactus blooms. Campsite: The Tanner Point camp sites are hike-in and don’t have water so you’ll need to bring it. The water from RV bath house tap was salty tasting so bring water from home or you can do as we did and buy it from the camp store. Most of the campsites at Tanner Point are great but we think we lucked out and got the best site with #5. We were assigned the site so are not sure if campers are able to request specific ones. When we visit again we will ask for #5! It has room for multiple tents and easy access to the Lake Buchanan. The site is large and private with a beautiful shady Live Oak tree at one end. After our hike on Saturday we took our camp chairs to the edge of the water and watched the sun sink over the horizon and the full moon rise over the lake. 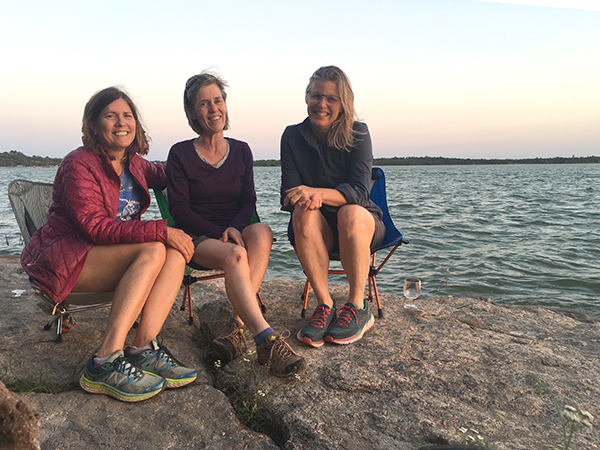 Judy, Bettina and Kelly relaxing on the rocks along the shore of Lake Buchanan. This spot is part of campsite #5. After our afternoon hike we had a cold beer, a cool dip in the lake and watched the sunset. Bettina and Kelly relaxing on the rocks along the shore of Lake Buchanan. This spot is part of campsite #5. After our afternoon hike we had a cold beer, a cool dip in the lake and watched the sunset.Saturday Hike: It’s important to know that if you’re going to Canyon of the Eagles for hiking about half of the trails are closed from 3/1-8/31 for endangered and threatened species of Golden-Cheecked Warbler and the Black-Capped Vireo. Even with the closed parts we hiked about 6 miles on well marked and neatly maintained trails. We walked from our campsite to the Amphitheater across from the RV Bath House. From there we took the Rocky Point Trail to Lakeside Trail around to the 13 marker to the road and back on the Bird and Butterfly Tail. The trails are mostly flat with lots of mesquite trees and cactus full of bright yellow blooms this time of year. Sunday Trail Run: Since the amount of trails that are open are currently limited we traveled along the same path as we did on Saturday but ran our route counter-clock-wise for a change of scenery. Kelly happily breaking down camp on Sunday morning after a pretty good night’s sleep testing her new ‘sleep system’. She added an egg-crate type pad under her Therm-a-Rest for added insulation and padding. 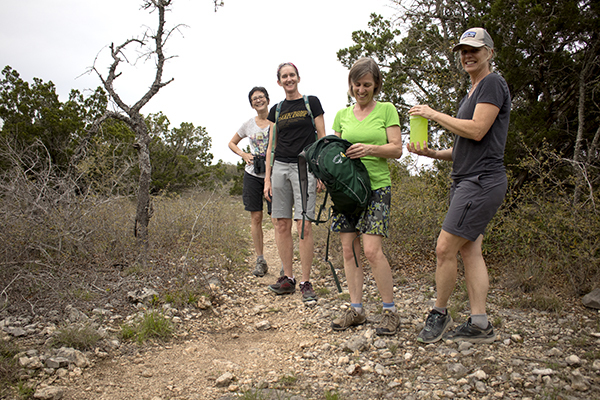 Suzanne, Maria, Bettina and Kelly taking a water break on Hermits Trail during our Saturday afternoon hike. Walk-in site 126 in the Chaquita Falls Camp Area is our favorite place to camp in the park so we were happy to get it again. Campsite: As with our last visit here, we got the Walk-in Campsite in Chaquita Falls #126. Don’t forget to bring your water since there is no potable water at the park. It was worth the hike to the site since we had the place all to ourselves. Saturday Hike: We took the car and parked along the road at the Hermit’s Trailhead. 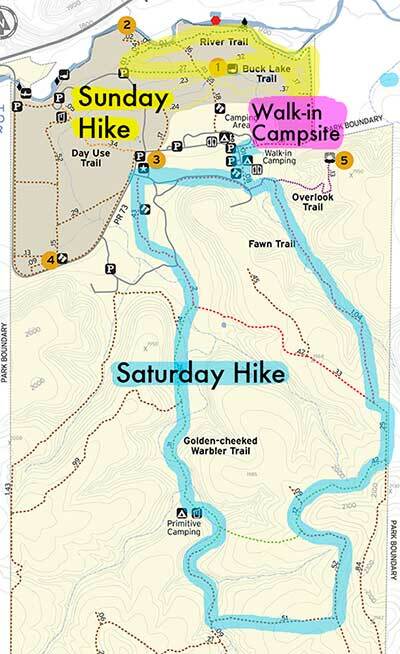 We hiked Hermits Trail to Side Track Trail, Good Luck Trail and back along Hermits Trail. About 3 miles. Kelly has a heart rock radar. 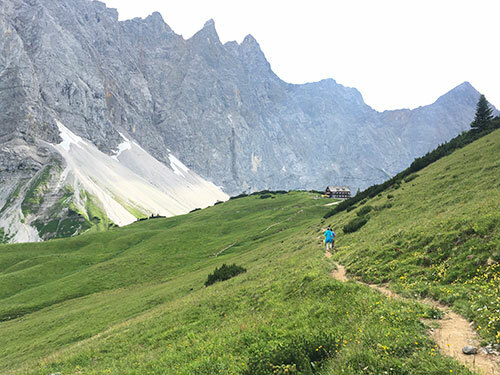 Sunday Trail Run: To mix things up, we decided (thanks for the idea Maria!) to try a trail run on Sunday morning. 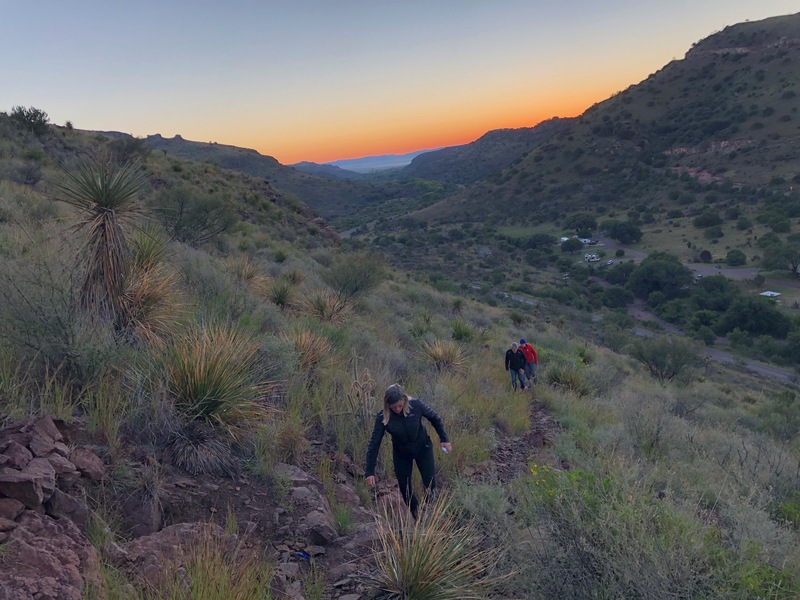 From our camp site at Chaquita Falls we ran Heritage Loop towards Comanche Bluff, Overlook Trail to Medina Loop and back towards Heritage Loop to our camp site. About 4 miles. Sunday Hike: After the trail run, breakfast and taking down our camp site we drove to the parking area by the West Peak Overlook Trail. We started off on the Spring Branch Trail to the Madrone Trail, took the Vista Ridge Trail that loops around back to the Madrone trail. We headed back on the Madrone Trail until it intersects with the Spring Branch Trail and took it back to the road towards our car. About 5 miles. 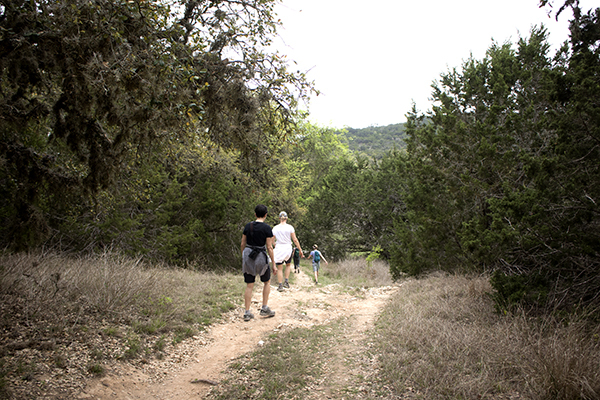 Sunday hike along the Vista Ridge Trail. Sunset over the Llano River after our hike on Saturday. 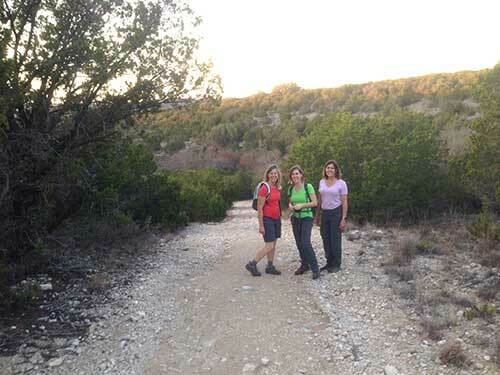 Kelly, Bettina and Judy on the Fawn Trail on Saturday. Pre-hike: Met in Munich on Friday June 30th, at the Muenchner Kindl. Toured the city with Mike’s Bike Tours with our guide Ryan Hadaller (we recommend the tour and the guide!). Highlights were Englischer Garten and dinner at the Biergarten (reasonably priced) and the surfers on the Isar River. The next day we had Judy’s Birthday breakfast at the Glockenspiel Cafe, then visited the Lenbachhaus museum. Then on to the Munich train station for a 2 hour ride to Mittenwald. We arrived to pouring rain and we purchased a few umbrellas and took a taxi to our apartment at Gastehaus Alwin Hornsteiner that we rented for the entire time we were hiking so that we could leave our luggage. The following day we spent hiking in the rain around the Kranzberg area and around the Lautersteiner See. 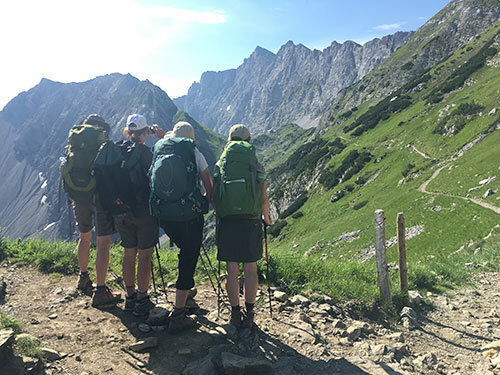 Day 1, July 3rd: Left our apartment in clear weather ,walked about 2km through Mittenwald to the trail head then on to our first hut of the trip, the Hochlandhuette (1630 meters high). We hiked about 3.5 hours, covered 8km, and climbed 900 meters. Hut Highlights: Beautiful view, only accessible by helicopter or hiking. Our sleeping arrangements were in a room with 10 beds, 5 beds on one wall, 5 on the others, our group took up one wall of beds. 44 beds total in the Hochlandhuette. Our dinner was a yummy pea soup. Cash only. No showers and only cold water. Beautiful weather! 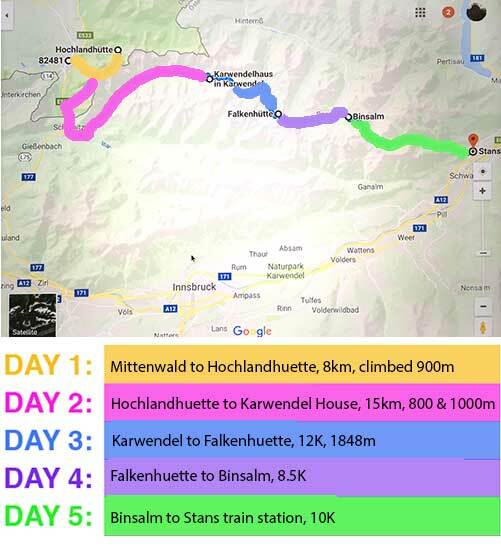 Day 2, July 4th: Two routes to chose from to get to our next hut, the Karwendel Haus (1765 meters high). Kelly took one route and the rest of us took the other. We hiked about 6 hours, covered 12 to 15km, climbed 800 meters down and 1000 meters up. Hut Highlights: Big and beautiful hut, 140 beds total, most comfortable lodging (we had our own rooms – a double and a triple), the best breakfast (excellent jam) of all of the huts we visited, fun, energetic vibe in the common areas. Cold Showers! They accepted credit cards. Continued perfect weather for hiking. Day 3, July 5th: On to the Falkenhuette (1848 meters high) we hiked about 3.5 hours, covered 12K. Hut Highlights: Delicious buttermilk, friendly, talented host/chef Fritz and his family. Nice homemade food. Great side trip to Mahnkopf (over 2000 meters) Great sunset view in lounge chairs. Lots of friendly guests. We were all in our own room with 3 bunkbeds. More great weather. 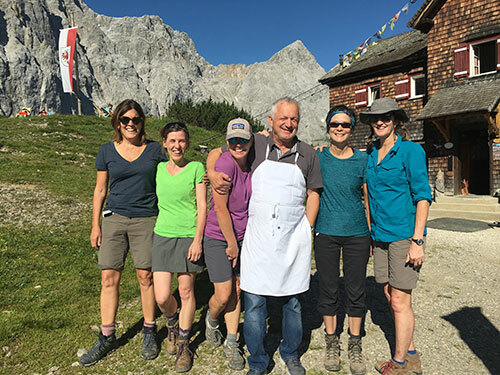 Day 4, July 6th: We left the Falkenhuette and hiked to the Binsalm and stopped along the way to have lunch at Eng-Alm. We hiked about 3.5 hours, covered 8.5K. We had our own, spacious room with 5 single beds.Hut Highlights: Great view from the front deck, free schnapps! Post Hike: That night we had a well deserved, delicious dinner in Mittenwald at Haus am Kurpark, walkable from our lodging. The next day we walked to the train station and took the train to Venice via Innsbruck (6 hours to Venice). In Venice we rented an apartment from HomeAway Villa Bellini for 4 nights and explored the city including the Biennalle Arsenale. We took a ferry to the island off the cost of Venice Lido and rented bikes and rode down the beach, caught another ferry to Pellestrina island and rode down the beach, swam in the Adradic Sea and had a wonderful lunch at the Da Memo.